It often comes as a surprise to Lake City visitors that the Denver & Rio Grande Railroad operated a branch into Lake City for 44 years, from 1889 to 1933. Undoubtedly, because the line was completely dismantled in 1937 leaving very little trace of its route, it is hard to imagine where the little narrow gauge train ran. Also, unlike other Denver & Rio Grande lines, very few photos were taken by the Denver & Rio Grande of the Lake City Branch, adding to the mystery. This page recounts the history of the Lake City Branch through a lively discussion between Grant Houston, President of the Hinsdale County Historical Society, and Lyn Lampert, writer and expert fisherman who has done extensive research on the Lake City Branch. A "Virtual Train Tour" takes the visitor on a ride along the Lake City Branch and over the "Lost Bridges" using rare, vintage photos. Old and newly created maps show the location of the depot and key points along the route. Become acquainted with members of the train crew, such as P. J. "Pete" Ready, the colorful train engineer who steamed into Lake City on its first regular run with Engine Number 58 by visiting the People section. The Lake City Branch had ten major bridges spanning the Lake Fork of the Gunnison River and over several deep, rocky gorges and ravines on its journey between Sapinero and Lake City. 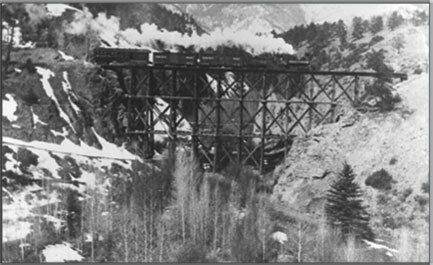 With the dismantling of the railroad in 1937, these bridges were torn down and the large timbers were salvaged and sold off, for example, the huge timbers from the famous High Bridge were used in the construction of the Community Church and Ruland Junior High School in Gunnison. The famous Western photographer, William Henry Jackson, took the above rare photo of the Elk Creek Trestle with a mixed train steaming across during the early days of the Branch. Jackson also took photos of High Bridge and the bridges at Lake Fork Junction that can be seen by taking the Virtual Train Ride. Bob Lozano, Museum volunteer and explorer, has relocated the mysterious “lost bridges” by digitizing old railroad maps and identifying bridge grid coordinates through modern geographical information systems. Locations have been documented and photographed. Some of these photos can be seen on the Virtual Train Tour. We have labeled the above photo of two young ladies posed by the Lake City Depot in 1911 on a burro as "taking the shuttle to the depot". Colorful stories of the train crew, particularly P. J. "Pete" Ready, and local residents have been documented and are presented under The Crew Heading. Funding to establish this website provided by David and Kay Cherry.